Okra is a beautiful vegetable with great taste and health benefits. The rare combination isn’t it. Okras are a very healthy source of vitamin B, vitamin C, folic acid and calcium. I am sure everyone is aware of the vitamins and calcium but consuming folic acid naturally is so important for women, especially during their conceiving years. Okras also help to control obesity and keep in check the insulin levels with people suffering from Type 1 and Type 2 Diabetes and women suffering from PCOS. Let’s chop them, try to cut them the same size, so they cook equally and well. Our okras are chopped and ready, so let us jump into the ingredients followed by the recipe. Preheat the pan on a medium-high flame. Add 2 tbsp coconut oil, once heated add the okra. Saute them until they become little crispy, (if you like your okras well done then saute them until they turn brown, make sure they don’t burn) and put them aside on the oil soaking paper. The okras are now done, so we start the preparation for the curry. In the same pan, heat 2 tbsp coconut oil on a medium high flame. Add mustard seeds, once tempered start adding garlic, ginger, green chillies and curry leaves. Saute them until the raw smell is gone. Add the onions now and saute them well, until they appear translucent. Add salt, it will help the onion to cook faster. Set the flame to medium-low. Add turmeric, red chilli powder and coriander powder to the onions. Let the spices cook for a minute. Umm.. quick tip.. if you like your curries red in colour, I suggest adding the Kashmiri red chilli powder right away after the mustard seeds temper.. this way the curry will have a nice rich red colour. Once the spices are well cooked, start adding coconut milk. Continuously stir, to avoid milk sticking on the pan if the pan is very hot. Bring the coconut milk to a boil and add the fried okras. I served the curry with phulka rotis aka chapathis and moong dal. If you like this recipe, give it a thumbs up. 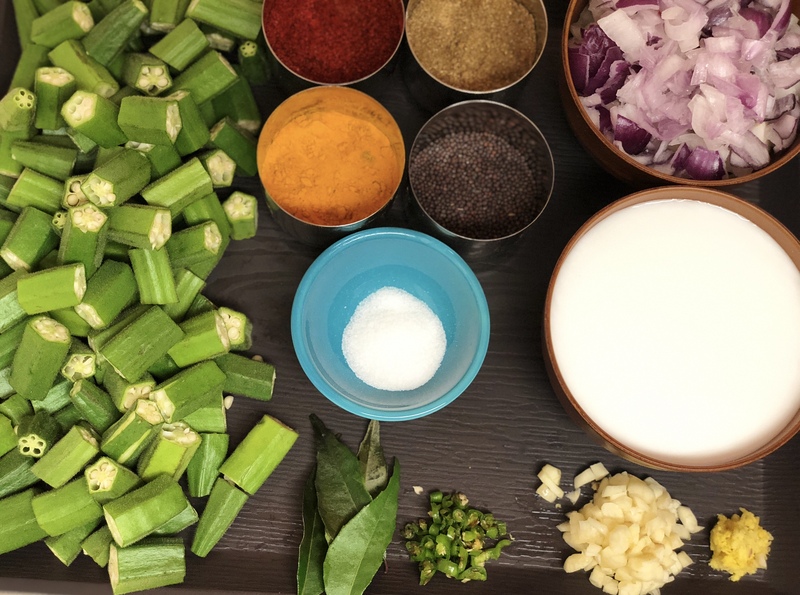 This entry was posted in Indian Curries and tagged #indianfoodblooger #indianBlogger #IndianFoodPhotography #healthyliving #healthylifestyle #indianfood #homecookingadventures #homecooking #browngirl, #southindiandishes #healthycookingwithA. Bookmark the permalink. Okra is a nutritious vegetables … love it .. Thank you 🙂 Indeed they are very nutritious and they taste so good! !